In 1995, we asked the Stonespirits to design a Quartz Crystal Singing Bowl with us. They came up with a wonderful bowl unlike any other singing bowl we had seen- it had a handle on it. They explained it to us, "When you hold it, the vibrations of its song run through your entire body enlivening you, clearing your separation and attachments. Then it gives your new life back into the Earth and back to the Crystals growing inside of her, in gratitude. As it pulses in your own hand, you will know all this directly, plus the gifts and the healing of sound." By connecting with the Crystal Devas first, we established an exchange of respect with them. That allowed us to produce Bowls with such deep resonance that they played very easily; they held their pitches for extraordinarily long times, sometimes even sounding more than one tone simultaneously. Even better yet, with the handle we learned to run the Bowl up and down our bodies so that its vibrations would directly massage the exact parts of us needing extra regeneration. There are many, many people who have already talked about the profound results of Crystal Singing Bowls. 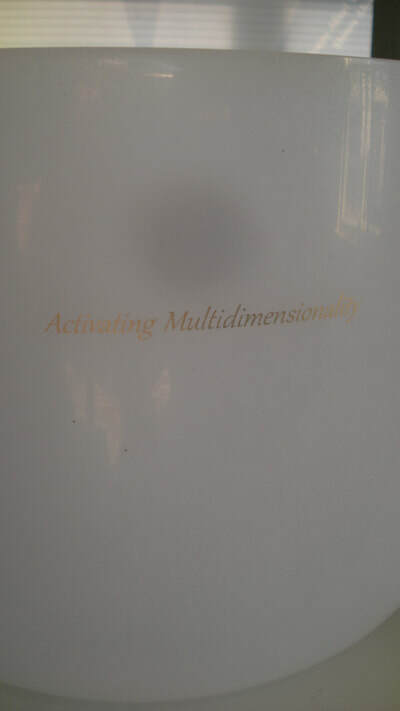 We have been told that their pitch can dissolve blockages in your system immediately. What we, personally, can tell you about our Bowls is that because they were co-created from the heart of the Crystal Spirits, their songs completely enliven us! They touch us physically, mentally, emotionally and spiritually. Every time we hear them, we expand our wholeness so immediately and so spontaneously that it requires no effort or understanding from our conscious knowledge. In working with our Spirit family we know that sound vibrates thought directly into manifestation. These Crystal Bowls spontaneously teach us how to constantly manifest what we think and feel. In our Health Kinesiology practice we find that playing them virtually always aligns all the meridians of the body immediately. These are just some of our experiences with these Bowls and all of them empower us completely. We find that these Bowls work especially well for bodyworkers, practitioners and essence makers. We choose to align with each Bowl as an individual life force entity, therefore we do not classify them by note. Rather we ask you to open your heart to receive each Bowl that is meant especially for you by asking for it to join you in your life by listening for the one that resonates with your particular mind/body/spirit alignment. These Bowls are different; different than anything else out there. If you experience one, you will know why. They are in resonance with Spirit, consciously and respectfully. the VAST and palpale difference in them. So we went back into production, challenging as it can be, and have continued to expand on the original geometries by adding Gold and/or Silver and a smaller size. NEW! We now also offer a Gold/Platinum combination Bowl, with either one on the outside and the other on the inside. These new Bowls are REALLY special!! They are an added $100.00 in either size, only to cover the complicated rim-blending process we are charged by the Coating company to make that transition clean where the Gold and Platinum meet. 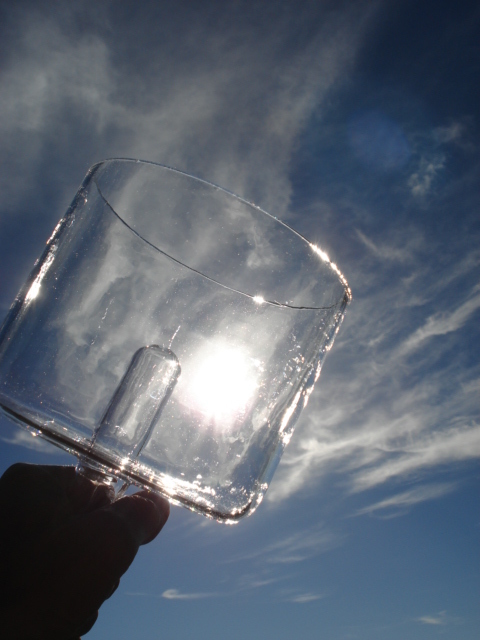 Pictured is the 6 inch hand-held Clear Singing Bowl. This is the 6 inch size of the original design. It, generally speaking, has a higher tone than the 8 inch bowl. 8 inch Platinum Bowl coated both sides. however you give it voice. We are so lucky to have this technology available to us now. It is rooted in the computer industry and the application of both the Gold and the Platinum is a VERY strictly controlled and technical process. The application is done electro-magnetically in a vacuum under very strict conditions to eliminate as much as possible any free floating particles that do not belong there. Even so, there will ALWAYS be some small imperfections in each Bowl. There is simply no way for it not to happen. They tend to show up a little more in the Gold as it is so highly reflective and lighter in color than the Platinum. It is also difficult to control the application of the metal coating on the inside of the Bowls, so you may also see "flat spots" or "dullness" on the inside of your Bowl. Each Bowl when coated is totally unique and that inside surface is always the place most likely to have anomalies. The coatings are applied 3 times to the inside and outside of each Bowl (unless you ordered and purchased one that has been only coated on one side) and each coat has the potential to show up any minute particle from the last coat. The highly reflective coatings also tend to show up small imperfections in the manufacturing process of the clear quartz Bowls themselves, as even though they are 99.9% pure quartz there are still those very small organic matter pieces that find there way into the mix. So please realize that each Bowl is highly individual and unique on its own, as it should be. None of us could afford to throw out a Bowl at any stage of the process for a small visual imperfection even if we wanted to, for we would then lose the cost of the Bowl and the cost of the Gold or Platinum which is not recoverable. These Bowls go through a multi-stage examination at every step of the way to insure as much as possible that they have the best chance of making it the whole way as cleanly and purely as possible. We respect these intense efforts and tend to look at any “imperfections” as beauty that just asked to be there in its own special way. We invite you to love your Bowl for its uniqueness and individuality just as you would any other live being. We have actually found that some Bowls with seeming visual “imperfections” actually SOUND better and are happier to play and evolve along with us. Do your best to live with your Bowl over a period of time before making any decisions about its performance and its relationship to you and vice versa. Please also be aware that the coatings can scratch easily and should only be cleaned with pure water and a very soft cloth (actually in the computer industry, they only touch a coated quartz part wearing gloves in order to not put oils from the skin onto the surface). Again, another reminder that with the Bowl bags and Carriers are sometimes tight. Remember to push down on the Bowl- not the handle- to insert it all the way into the bag and remember to pull slowly and gently STRAIGHT up to remove the Bowl from the bag (I put the bag on the floor and hold it between my feet and then pull the Bowl out so I can have a strong base and a clear field of awareness as to what is happening). Patience, presence and breathing is a key ingredient to insertion and removal of the Bowls from their bag/homes. 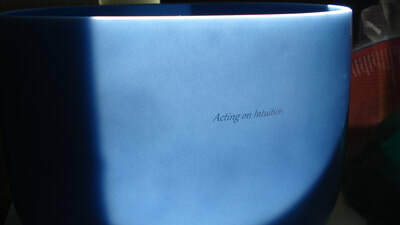 This is an important ingredient in the sound process as well and we find serves us greatly in awareness as practice. Stay “tuned in” to your Bowl, your Bag, and your process in relationship to both of them at all times, and SMILES will be your constant companion! Please call us with any questions, stories or comments. Blessings to us all. The Cosmic Tuners are specially created 5 inch Quartz wands that are made to fit inside the handles of the Deva's Gift Bowls. This allows you to have one Bowl with the ability to resonate the sound vibration of each of the Cosmic Tuner wands- in effect, having the ability to play at least 8 different Stone vibrations in with one Bowl. We originally listened to the Deva of Crystal and she generously offered us the design for a new, hand-held Quartz Singing Bowl in 1995. Ever since then, we have made the Deva’s Gift Crystal Singing Bowl exactly according to those wondrous specifications, with all of our love and joy and complete presence. It asks that much of us— so that every single Bowl lands upon the Earth utterly open and ready to be played by its perfect human caretaker. For us, we don’t make anything in mass, unconscious production, because each co-creation given to us by our Spirits to make is absolutely sacred. It comes through our open-hearted listening with our Spiritfamilies where no two conversations are the same. No cookie cutter process. It insists that we be as completely present as possible in each breath, each second, each precious word. ​This is also how the Cosmic Tuners were born. Each of the eight Stonebeing combinations in Quartz Wands in this set offers themselves with precise energies that alchemically support fast-evolving human beings and the unlimited lifeforce available to chakras. When you place one of these Stonecombination Wands into the hollow handle of the Deva’s Gift (Yes!) and play, the Bowl’s crystalline songs spontaneously, utterly change their vibrations. They align uniquely with you: Because the Stonecombinations and the Bowl have been listened to and honored in every step of their creation, they are formed to listen to you, now. Their energy matches yours—wherever it is moment-to-moment— and serves your glorious needs, as much as you allow. Each Cosmic Tuner Set comes with 9 precision made, alive Stonecombination Wands, homed in an organic Bamboo Bag and includes a black rubber stopper to hold the Stone Wands inside the handle of your Bowl. Hematite: I AM grounding the healing that you have freely asked for on all levels. 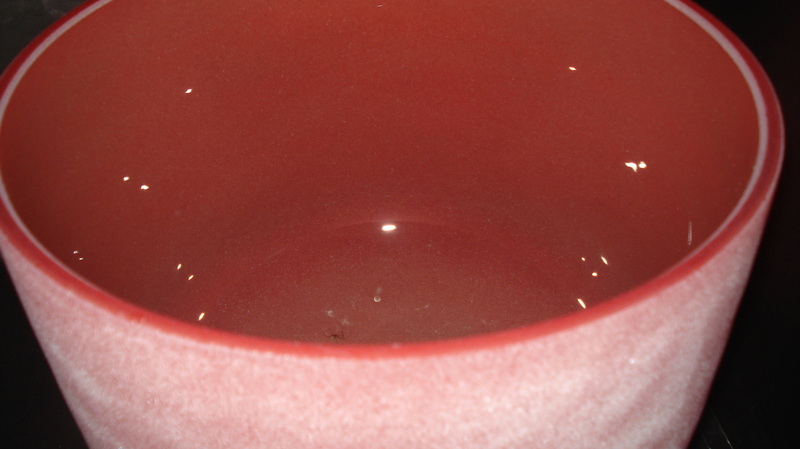 Red Jasper: I AM revitalizing you at the core: Drink it in richly! Carnelian: I AM growing your dreams exponentially, JOYFULLY! Green Aventurine: I AM free to love, and then love more, and then be Love/d. Dumortierite: I AM creating the life of Wonder! Amethyst: I AM divinely and earthly aware….by unconditional choice. Pakimer Diamond: I AM connecting to the heavens. Moonstone or Rose Quartz: I AM bridging to the Universe through love you sweetly embody. 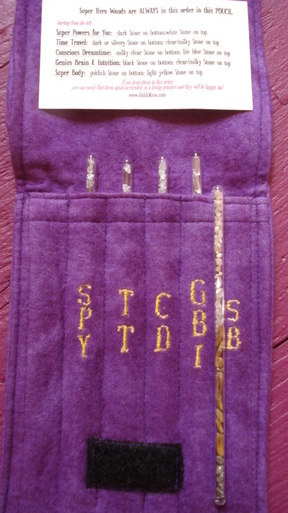 Each Cosmic Tuner Set comes in an Organic Bamboo fabric Pouch and includes a Rubber Stopper to hold the inserted Wand inside the handle of the Bowl. WOW! Through amazing synchronicities we now have Quartz Singing Bowls that are infused with Rare Earth Elements (which are the most energetically potent Stones we know of) and these bowls SING! They activate, they empower, and we find them surprisingly grounding. Each type of bowl offers its own energy therefore we have listened to those combinations of Rare Earth Elements and Stone to come up with a message about its energy for you. And as ever, whenever you get a Quartz Singing bowl from us, we will listen to YOUR bowl, specifically, for its Heartsong— the message from its heart to your heart in words and song. We don’t stock large quantities of these bowls, but you always can special order. We also have great Bowl Bags available. In 1995, we listened to the Crystal Deva, who asked us to co-create a new, hand-held Quartz Crystal Singing Bowl: the Deva’s Gift Singing Bowl. It immediately opened and grounded in new dimensions of healing and honoring relationship between evolving humans and Crystals and sound. Over the years, the Crystal Deva has led us to updating this original, unconditionally loving design with new sizes and metal coatings (Gold, Platinum, Gold/Platinum) over the Quartz. 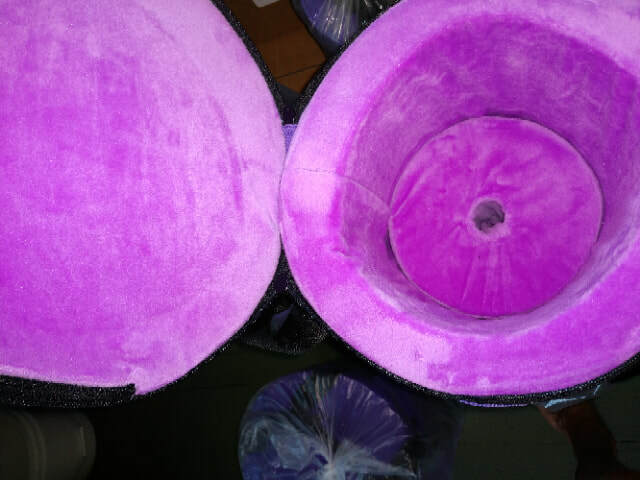 Now we are being blessedly stretched further………*Welcome to new, colored, opaque Quartz Singing bowls! These wondrous bowls come in: yellow; blue; lite blue; green and gray— all colored by Transitional Metals. They sit (instead of being hand-held) while you play them to focus on whatever intent you give them to grow in your body, your field, and your reality, as you choose. For instance, the Yellow-tinted bowl opens your thinking to magic. It helps to re-route your brain to new, truly supportive rituals and freeing beliefs. Together, you can link your thinking to open-hearted alchemy. 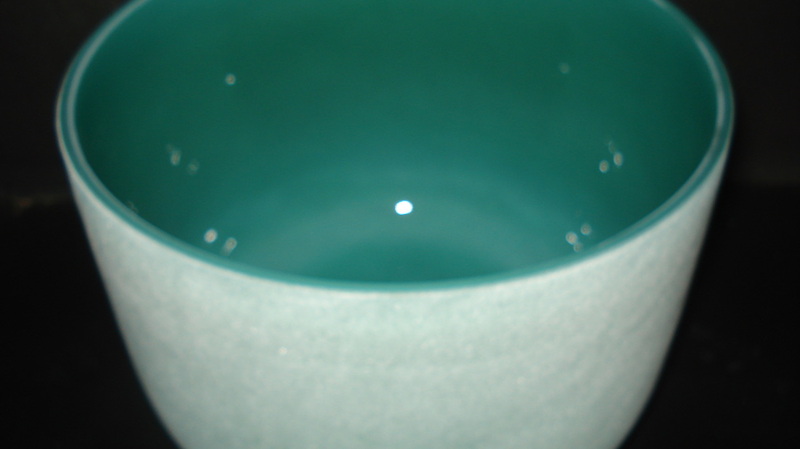 The Green-tinted bowl inspires your heart, “You are the leader in the body. Leap into that.” It grounds your most loving compassion and empathy, now, to spontaneously encourage you to always respond to everything as the unconditional being you truly are….and are evolving. These Bowls come to us through the same people that produce the Deva's Gift Singing Bowls with handles for us. This is a new technology that uses Transitional Metals to influence the color of the very pure Quartz. These Bowls come in either a 10 inch or 12 size and are available currently in 6 different colors/Metals. The process to make these new Bowls is proprietary and Patent Pending so we cannot get a list from the manufacturer of the EXACT Metals used but we have a very good idea of what they are and, of course, an even better "idea' of the energies involved in their inclusion as it gets exposed in our Listening directly to each Bowl. These Bowls are also made especially for us. We had been searching for years to brings more core Elements (non-reducable Elements from the Periodic Table) integrated into Singing Bowls for increased healing potentials. These new Bowls have finally been created (through a proprietary process) and landed in our laps! We are so grateful. These Bowls are very potent and we are also excited to finally receive the Red Bowl, which is a much more difficult and involved process to create. We are also quite pleased with the evolvement of the Grey Bowl as it currently includes a somewhat purple hue to support bringing Ethers and Earth together in a grounded tone. 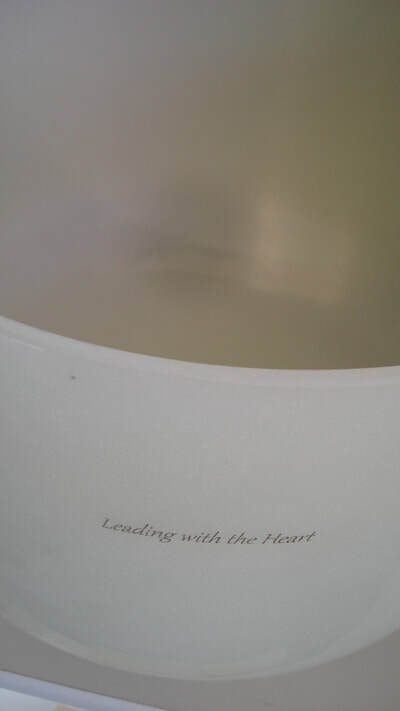 *Again, as always, we listen to the heart and Spirit of each Quartz Singing bowl and record its message (Heartsong) to give to you, its new caretaker. Medium and Large sizes, approximately 24" long. $360 and $480 retail. Includes carrying case and mallet. ​Approximately 2 feet wide. $1600 retail. Welcome! It is our chosen service & JOY to offer you ever new, profound tools to support our out & out evolution! That’s why we co-created the “Genius Brain Expansion Quartz Chair.” By consciously combining Stones & Sound with your empowered intent— right over your brain—you can literally, spontaneously reprogram your own brain (and therefore your Body Electric) as you truly, magnificently choose. Form a powerful, open-hearted intent with positive, affirming, present-tense, clear language that is focused simply, respectfully on you. Sit on the Shungite cube which will ground the intent immediately. Feel your body responding and integrate it all completely (while simultaneously, automatically releasing anything else you don’t need….like distracting mind chatter). Sit with your spine straight yet flexible, so your full, deep, conscious breaths will circulate clearly throughout your entire body. Say your intent until you feel it throughout your body & being. Invite us to listen to two Stone Wands or Stonebeings you can hold, one in each hand chakra, to grow your natural manifesting powers to co-create your intent here & now in giving and receiving. 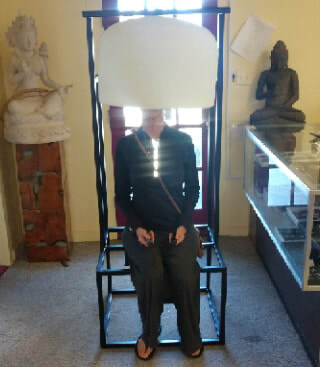 When you’re completely present, let us know and we will chime the 22” “Creativity & Power” Rare Earth Mineral & Quartz Singing Bowl poised over your head to light up your genius brain—the latent parts of the brain that are not completely activated….yet. Tone with the bowl as you wish. Keep repeating your intent and ground it in. As we continue to evolve, consciously, we are profoundly led to the immediacy of transformation that sound offers us. Ahhh~ We have offered the Deva’s Gift Quartz Singing Bowls for a long, wondrous time, and now we are complementing that with new Nepalese 7 Metal (as in Vedic Astrology) Singing Bowls made in Nepal. These newly made Bowls come to us through our Nepalese Brahmin friend who we trust so deeply. They are manufactured new in Nepal and are truly made from the traditional 7 Metals (listed here in order of their largest % first): Copper; Tin; Iron; Mercury; Lead; Silver; Gold and are tempered in 1000-1400° heat. 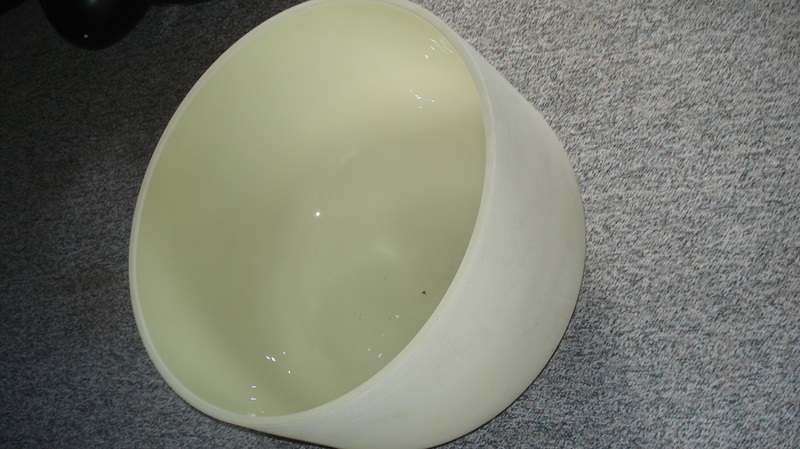 These Bowls sell by weight (as do all of the Tibetan Bowls) and tend to have a thinner wall then you may be used to seeing, but have a very high quality in both sound and physicalness and hold a very pure intent- or we would not have invited them into our array of healing products that we offer to you. We order these Bowls by size and weight, not tone, although if you have a specific request for a tone we can fulfill it as a special order if we do not happen to have one in stock. Again, we order these directly through our friend in Nepal and they are guaranteed 7-Metal. As with most things coming from Nepal, there is usually a variability in what we get. The Bowls may not look exactly the same each time we order as it is quite a different, less-mass produced process in Nepal. Again, we treat these Bowls (like all the other Bowls we carry) as individual sentient beings and embrace each one for its unique and special healing and inter-relationship properties. We are so blessed to be able to offer these old (over 100 years) Tibetan 7-Metal Singing Bowls. They come to us through our Nepalese Brahmin friend who lives in Katmandu. He lives and breathes in the circles where these types of items become available and he respects and trusts us in his witnessing of how we hold space so much that he knows in his heart that we will pass these special items on to their new appropriate homes. We are honored. Most of these Bowls came out of Tibet during the Chinese "takeover" and eventually where housed and used in Nepal (or elsewhere) or sold in need for food, shelter, etc. These Bowls are true hand-made 7 Metal Bowls that are signed and come with documentation from our Brahmin friend. This can be well trusted and is the only place so far that we have been able to find this kind of definite information and documentation. Of course, the quantity and availability of these old Bowls is very limited. We can not predict when or how many Bowls may come our way. Pictured is an old Chakra Bowl that we are retaining for our personal use. We recently had a full SET of 7 Bowls that represent the 7 Chakras (SOLD). We currently have NONE in stock. The 7 traditional Vedic Metals used to produce these Bowls are Copper; Tin; Iron; Mercury; Lead; Silver, Gold. ​ "For some time, our Spiritfamilies have been working with us so that in this perfect time of over-night transformation, we can spontaneously and gracefully evolve as much as possible. Yes! In that generous support, they have asked us to utilize intentional, powerful sound to grow our own genius. They ask us to tone, to use tuning forks & quartz singing bowls, and to ground all that corresponding newness into this reality, here and now. These wise, old-world-crafted Singing Bowls innately balance every part of us very graciously. They especially inspire us to keep going THROUGH the fear of our new possibilities, and to trust. They grow our trust immediately and very potently. Their every tone emboldens us to be what we are becoming, now, even when we don’t yet understand it in all ways." We also carry old 7-Metal Bowls that we purchase from other Nepalese. 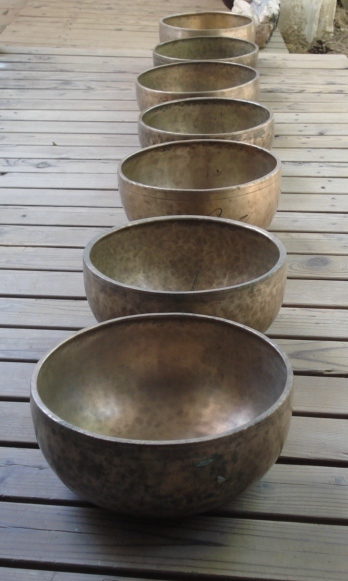 These Bowls are not guaranteed but anyone familiar with these Bowls can immediately tell the difference in the sound and the energy of a true 7-Metal bowl. 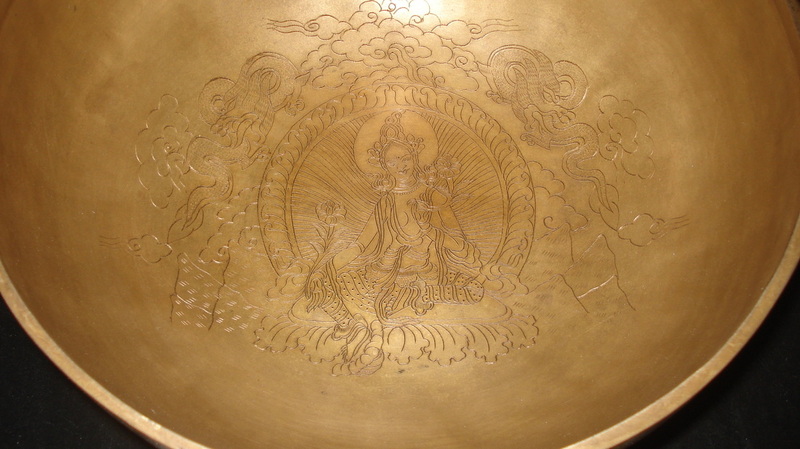 The particular Bowls that we bring here of this kind also have specific deities engraved inside the Bowl. The usual possibilities are Buddha, Ganesh, or Tara. Again, it is hard to predict when we might have stock of these as we usually only get one or two a year. Just call and ask to find out what we might have or when we might get more. This Quartz Didj was originally made by us many years ago and previously was longer than its current 48 inches. We have downsized it to its present 48 inches in order to lower its production cost. It is based solely on a design given to us by the Quartz Deva and, like the Singing Bowls, we have respectfully maintained our commitment to that design.